Mount Farm Surgery is a modern, efficient and well-equipped GP surgery in the Moreton Hall area of Bury St. Edmunds. First established in Looms Lane in Bury St. Edmunds, we moved to the Moreton Hall Estate approximately thirty years ago, which was built on the original Moreton Hall farmland at the top of Mount Road (hence the name ‘Mount Farm’). Mount Farm Surgery is a forward-thinking medical practice, offering patient-centred health services that combine the values of the traditional family GP with modern and innovative patient care methodologies. We endeavour to offer proactive care to ensure the best of health for our patients. Often health issues are related to other aspects of a patient’s lifestyle, and we believe in helping our patients to improve their overall health and well-being, wherever possible taking the opportunity to prevent illness and not just treat it. We routinely check up on patients with long-term conditions to ensure we are providing effective care. We also run a series of clinics and patient workshops that provide valuable help and support to those dealing with long-term conditions such as asthma and diabetes. Three of our GPs have the additional skills, experience and qualifications to support qualified registrars through their vocational training to become a GP. This also ensures that our own services are in line with the latest medical knowledge and practices. 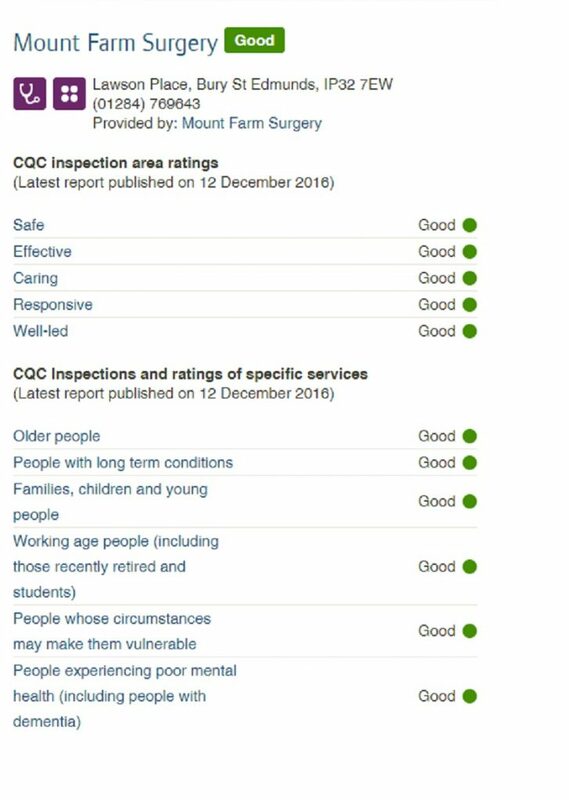 Mount Farm Surgery is a member practice of the West Suffolk Clinical Commissioning Group, which is committed to the ongoing improvement of local services through working with West Suffolk Hospital, community services in Suffolk and the Suffolk Mental Health Partnership Trust. We are members of the Suffolk GP Federation, a not-for-profit federation of 61 independent GP practices covering 540,000 patients. The federation promotes collaboration to improve services for patients, share best practice and address issues that cannot easily be resolved by individual practices.